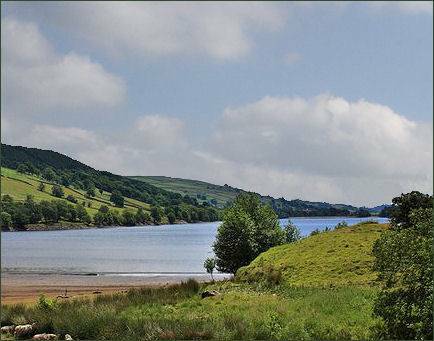 Gouthwaite Reservoir is one of many in the Nidderdale area, including Roundhill and Angram Reservoirs. 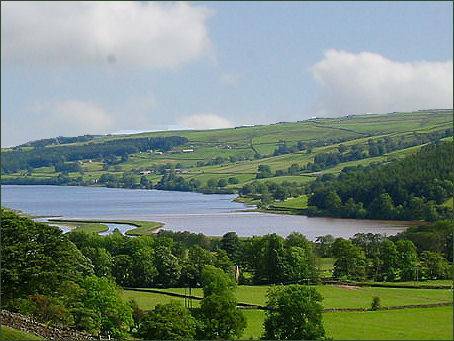 Gouthwaite is a compensation reservoir for the River Nidd, maintaining the downstream flow of the river during periods of lower rainfall. The reservoir was built between 1893 and 1901. Gouthwaite Hall an Elizabethan manor house and the ancient home of the Yorke family, was submerged beneath the waters. The reservoir is now a nature reserve owned by Yorkshire Water who has created three viewing areas for bird watchers on the edge of the water. Tree and shrubs along the shoreline provides a habitat for small birds such as willow warbler and blackcap. Great spotted woodpecker, green woodpecker and nuthatch have also been spotted there. Canada geese on the reservoir itself are joined during the autumn and winter by goosander, goldeneye, mallard, tufted duck and pochard. Whooper swans from Iceland are often frequently sighted. In winter the margins of the reservoir are home to fieldfares and redwings. Buzzards, red kites, hen harriers, merlins and kestrels are also seen around the reservoir and the surrounding moorland.